Built in 1970 at a cost of $445,000 (which, I'm sure, is a lot more in today's money). It was located in the Japanese mountain resort of Tateshina. 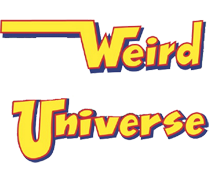 I assume it's still there, though I haven't been able to find any recent references to it online. Update: A more recent photo of it, via Tripadvisor. It's called the Tateshinayamashoko-ji Temple. Which mentions in the comments it was built by Toyota in the 1970s for "traffic safety". mjbird -- You've got some google skills! I couldn't find anything at all. It seems that it's called the Tateshinayamashoko-ji Temple. Searching for that keyword pulls up plenty of stuff on it. mjbird -- Strangely, while the sites you link to call the temple by its correct name, their pictures don't actually seem to show the temple. Or they're showing some other temple? You can tell by the number of columns. 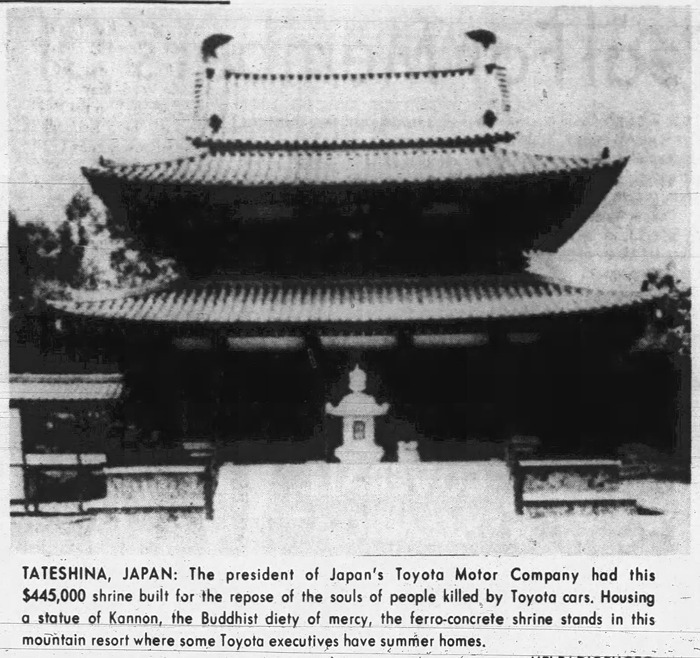 The Toyota temple had six columns on the ground floor. But the temple they're showing only has four columns. I found a picture on Tripadvisor (posted above) of what's clearly the same temple as in the 1970 news photo. Okay, I understand now. My stupidity. 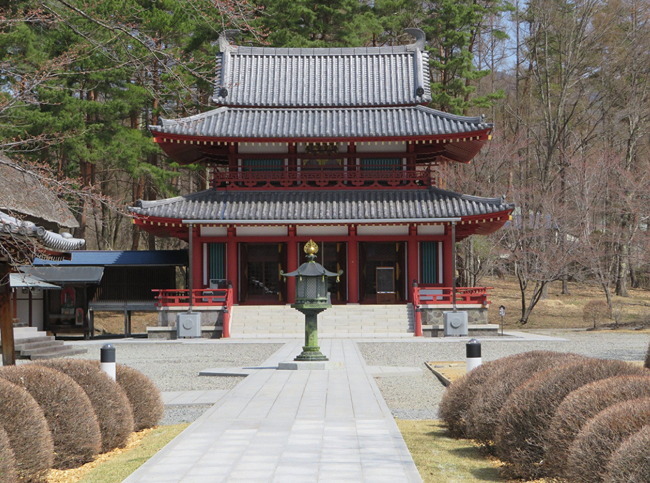 There's apparently a smaller temple building at the entrance to the shrine, which is what's shown on the inspirock and syokoji sites. You can see the main temple through the doorway. 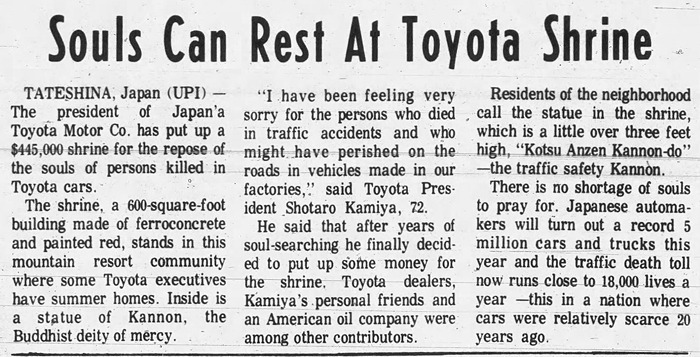 I liked the headline People killed BY Toyota cars more than the text which says People killed IN Toyota cars. It soumds more ominous. Good point, F.U.D. It has always irritated me that stories of automobile accidents nearly always refer to the vehicle as if it were sentient and out to kill humans. As if the human operating the vehicle had no part in the matter. Perhaps that idea crossed the mind of a certain Mr. King? Wasn't there a joke two or three years ago about a country song in which a guy's self-driving pickup left him? I can see a city-bred, self-driving, Toyota losing it during rush hour and killing its master. Thanks, Phideaux. That made coffee come out my nose! There was an episode of NCIS in which a prototype autonomous vehicle murdered a researcher (okay, so the vehicle was only the weapon, programmed by the murderer to lock the victim in, restrain them with the seat belts, and then asphyxiate them, but that's only because the show is too conservative to go the full sf route and have an insane AI). Asimov did write a good novel about a bunch of retired AI vehicles that kill someone who mistreated his truck, as told by the vehicle farmer and all-around favorite human of those vehicles. He makes them look like a herd of motorized bulls and cows. Because of him, I started petting my printer when it's misbehaving and it works better since. Science fiction has been full of the intelligent, self-aware car that turns on their owners. Steven King's "Christine", published in 1983, Roger Zelazny's 2 ovellas, "Devil Car" and "Last of the Wild Ones". I think Zelazny also had a short story about using an intelligent car as a bull in a bull-fighting scenario. I seem to remember someone was awarded the headlights and steering wheel. I anthropomorphize objects all the time, always have. I'd never presume to postulate on a technical/scientific level that it makes a difference, but I've always had good results. Some people talk to plants; I discuss things with my Chevy.